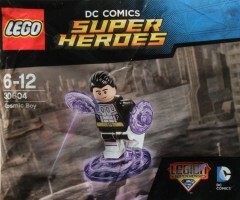 A correspondent has sent us an image of the DC Comics Legion of Superheroes 30604 Cosmic Boy polybag that was first revealed when LEGO inadvertently uploaded a load of images to its server the other week. I'm not sure where it was found but I will try to find out. Checkout the 'Legion of Superheroes' logo... wonder if DC will be doing more with them soon? Well, there is the long-rumored Lightning Lad in the next Target cube so I'm guessing the answer is yes. And just as the Superboy in the Target cube was a teaser for Titans, perhaps this is a teaser for more Legion sets. Legion pairs well with Superman so perhaps we will finally get some of his supporting cast and villains? He still has the purple dishes? Whatever for? That's the "Legion of Superheroes" logo from the animated series which ran around 2007-2008. Technically, I think it was called "Superman and the Legion of Superheroes." (There were some legal issues surrounding the name "Superboy" at the time, so even though Clark was a teenager, they called him Superman.) Not a bad show, but it only went for 2 or 3 seasons before Cartoon Network cancelled it. I'm guessing it's not a revival but just Lego borrowing the logo. Well doesn't much matter since i'm sure it won't come to Canada. Oh Boy... Cosmic Boy... LSH figures... I might as well just arrange for LEGO to receive my salary direct and I'll live off the change. I can see why the Legion would end up in odd places like promo polybags and Target cubes. They have a cult following, but they (for better or worse) haven't had the best marketing. Their comic probably peaked in the 90s, and then became kind of listless for awhile. They've been notoriously "rebooted" possibly more times than DC Comics itself. Their last two comic series only lasted about a year (I think) before cancellation. And like I said, their animated show only went 2 or 3 seasons before it was killed. But yeah, the Legion has had dozens and dozens of members. I'd say the big essential figures to get would be the original three: Lightning Lad (pending in a cube), Cosmic Boy (above), and Saturn Girl (and maybe she'll come in a book or DVD or something). Somebody like Brainiac 5 would probably be important too. After that, you start getting into semi-obscure characters who would probably be impressive to a Legion fan, but less important to a casual collector. Besides the original 3 members, would it be too much to ask for Timberwolf and Wildfire? The idea of LoS sets seems likely, but next year's first wave of DC is supposed to focus on the BvS movie. It could be a teaser for the second wave, but right now, it's almost certain there won't be any LoS sets in January. If you are getting Wildfire you'd be as well to get Dawnstar using the new Hawkman wings and if we are getting Dawnstar we might as well get Hawkgirl/woman as well since she is in the new Legends of Tomorrow. It would be interesting to know what the rules are for DC Figures for a minifig range ala Simpsons... Would they be counted as action figures and would be in breach of the deal with Mattel?